AyurvedicYogi » How to feel brilliant this Spring! The Ayurvedic daily routine lies at the heart of staying well, but if we fail to make some changes with the seasons, imbalances arise. The junctions between the seasons are common times to fall ill- many people catch a cold when the weather starts to turn warm after winter. It’s natural to hibernate a little in winter, and put on a few pounds. By the time spring comes your body needs to offload this build up. Otherwise, a cold, hay fever or chesty cough can develop- all signs of excess Kapha. This Spring Equinox, take a moment to be still and to detoxify as these are natural times to cleanse both body and mind. Try and wake up with the sun-rise as sleeping later will further aggravate Kapha (causing fatigue, lethargy and excess mucus). I have found myself explaining this chart during many consultations recently. 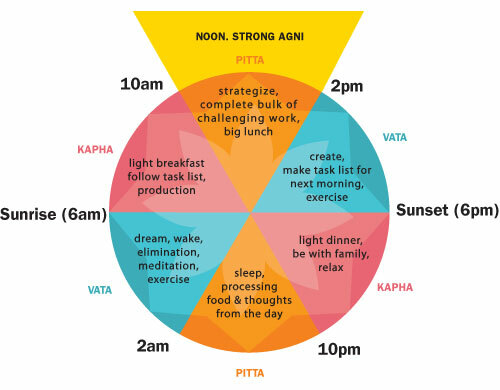 The concept of circadian medicine is gaining popularity and this chart helps me to remember that we are part of nature and will thrive if we live in accord with its rhythms. So be awake in Vata time if you can, then take a cup of ginger and lemon tea to stimulate digestion and clear mucus that has accumulated overnight. Use a neti pot to give the nose a daily rinse with warm, salty water. This not only helps ward off Spring colds and hay fever, but also improves your Pranayama. See here for an earlier post on this subject. Spring is a good time to focus on cleaning your tongue as well as your teeth. During the night, the tongue becomes coated with a film that can contain bacteria and toxins. Gently scraping from the back forward with a tongue scraper not only cleans but also stimulates internal organs, help digestion, remove toxins (ama), and bacteria. As well as regular massage or dry skin brushing, saunas can be useful for drying up excess secretions in early Spring. Practise vigorous exercise to get the lymph moving in the body, stimulate a sluggish digestion and aid detoxification of excess mucous. Make your yoga practice dynamic and stimulating. Reduce Kapha aggravating sweet, sour and salty foods which could cause water retention at this time. In common with the winter diet, minimise raw and cold foods, favouring warm, lightly cooked meals. Lighter grains such as quinoa, millet and barley are all Kapha reducing, but minimise wheat dominant foods and other mucous forming foods (dairy, wheat, refined sugar). Kitchari is an ideal detox recipe for Spring (See my recipe page for this and more). Ayurveda is not a huge fan of the raw diet, which is considered too cold and damp for all but those Pitta types with roaring ‘agni’ (digestive fire) in their bellies. However, a little raw food in Spring can be helpful to aid detoxification, eaten at lunch, when digestion is strongest. Add more bitter, detoxifying tastes (e.g. 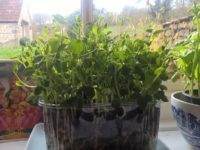 : herbs, micro greens, rocket, green leafy vegetables), as well as spicy (e.g. : fresh ginger herbal tea) and astringent (e.g. : all pulses). 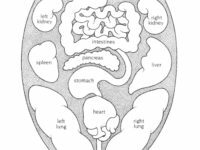 These three tastes open the channels of elimination, clearing excess mucus and moisture from the body. One easy idea is to grow micro greens on your kitchen windowsill, trays of seeds that you eat before they reach maturity (pictured above). 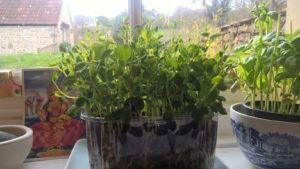 Pea shoots are delicious grown in this way- just buy a packet of peas from the nursery, sow in an old fruit punnet in seed compost and enjoy a feast a week later. Use spices to help digest such raw food such as ginger, cayenne, cinnamon, and basil. Try foraging for some spring greens which are naturally abundant just when we need their bitter, cleansing properties. 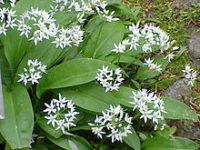 Examples include wild garlic, nettles and sorrel. Wild garlic is one of the easiest to collect from shady woodlands and parks. We are eating wild garlic risotto this week, one of my favourites as it provides the tail end of winter comfort food if the weather is still cold, but provides a healthy dose of spring greens with a kick (see three delicious and easy recipes here). Wild garlic pesto and nettle and leek soup is also a very tasty and quick recipe to get a bit of spring zing in your diet. 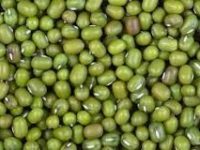 If you feel you are in need of a deeper cleanse, try a few days of just eating magical mung bean soup, preferably over a long weekend when you can retreat from the world. See here for an in depth post on how to do this cleanse. Spring is a time of new growth and potential. Take time out of busy lives to reflect about the year ahead and how you can best fulfil your life’s purpose (known as dharma in Sanskrit).